The long-wheelbase SVAutobiography Range Rover has legroom of over 1.2 metres in the rear. Yes, really. The Range Rover Sport SVR's talents lie elsewhere. Obviously. The car of choice for those not wanting to get bogged down. The BMW M5 in deep metallic blue went down better than the matte red in which it was presented at Frankfurt. Our editor was rather fond of the Ford GT in this colour combination. It's in shouty orange, as if the car wasn't loud enough. There’s usually an overriding theme at a motor show. 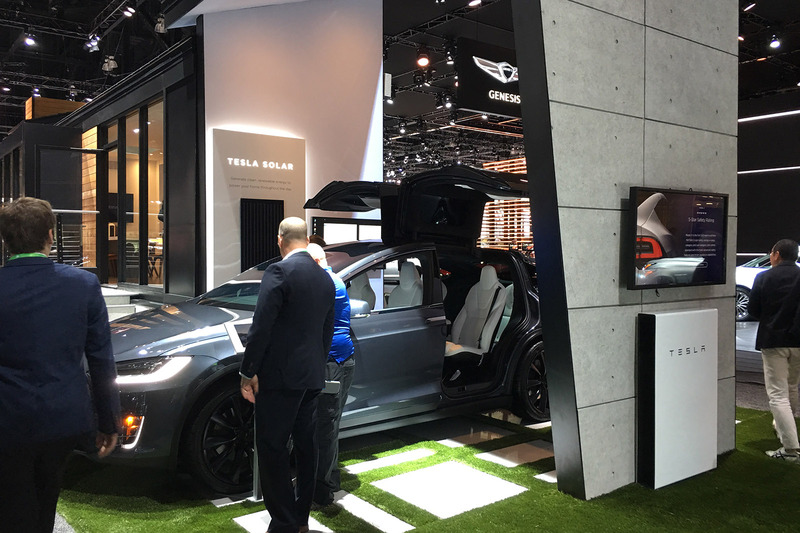 For example, Frankfurt this year was dominated by carmakers detailing their long-term electric plans, while January’s Detroit show had an air of the unknown as the world awaited Trump’s inauguration a few days later, wondering what impact he would have on the US car industry. But this week’s Los Angeles show was a very different affair: there were plenty of large, shiny stands from car makers – as you’d expect at a motor show, really – but very little all-new metal. For example, the Honda stand, though decent in size, had nothing new, with the main attraction the already revealed new CR-V. That was unusual because we’ve already seen it at an American motor show this year, yet the European version – near identical – is yet to be seen. It will make its European debut at Geneva in March, we’re told. There were some new cars, although many were public debuts more than grand reveals. Many manufacturers chose to reveal images of their new cars over the last few months, ahead of real-life debuts at the show. Those included the Porsche Boxster and Cayman GTS, Carrera T and the new Jeep Wrangler. That’s all well and good, but it means their appearance in a press event lacks the wow factor of a model never seen before show day. 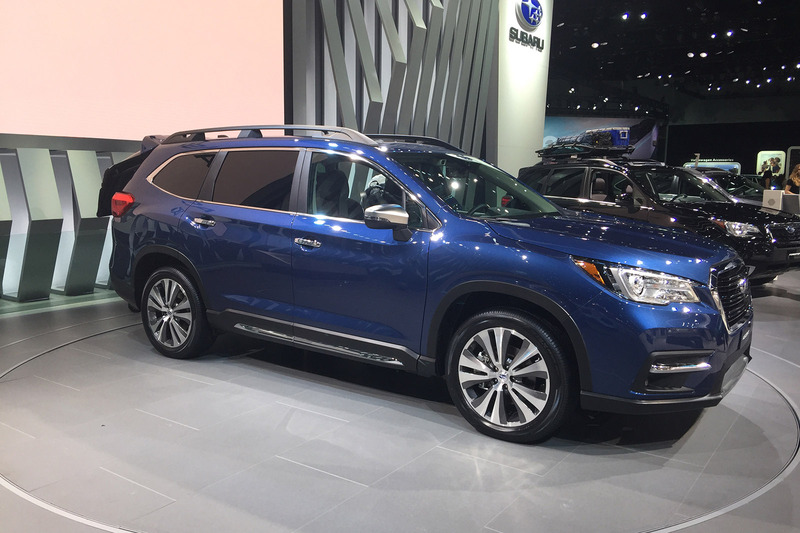 There was some all-new US-focused metal – for example, the Subaru Ascent large SUV. “Looks like a Forester,” noted one US journalist to no-one in particular. There was a Lexus RX-L, a three-row version of the RX, most notable because it only counted six cup holders, compared to the Ascent’s 19. The Infiniti QX50 sparked interest because a) it is the first model to adopt the brand’s nifty variable compression turbo engine and b) it could well be the model to help boost UK sales for the brand when it arrives late next year. Shortly before the show we sampled the new engine in a prototype QX50. Talking of UK sales boosts, Mazda revealed an updated Mazda 6, on sale late next year, with exterior changes so mild you might miss them. The biggest changes are engineering ones, with new chassis settings intended to make it handle better and be more comfortable. Jaguar Land Rover’s stand stood out – mostly as a reminder of how very important the US market is for them. The updated Range Rover took pride of place as did the I-Pace and an I-Pace racer, both of which will be aimed at making sure the electric SUV stays in the forefront of people’s mind ahead of its on-sale date next year. You can always rely on American shows to have some outlandish models on show, most of which are probably more remarkable to us as foreigners than the locals. The customs hall, a dark room with hip hop blasting out, is worth a visit if only to see a customised 1923 Ford Model T, which is so out of this world, it’s hard to conceive. In a quiet corner, there was also a Galpin-modified, new Aston Martin Vantage in all its brash, yellow glory. And of course, there were the obligatory pick-ups, which as a sensible Brit, are always absurd, yet amusing. 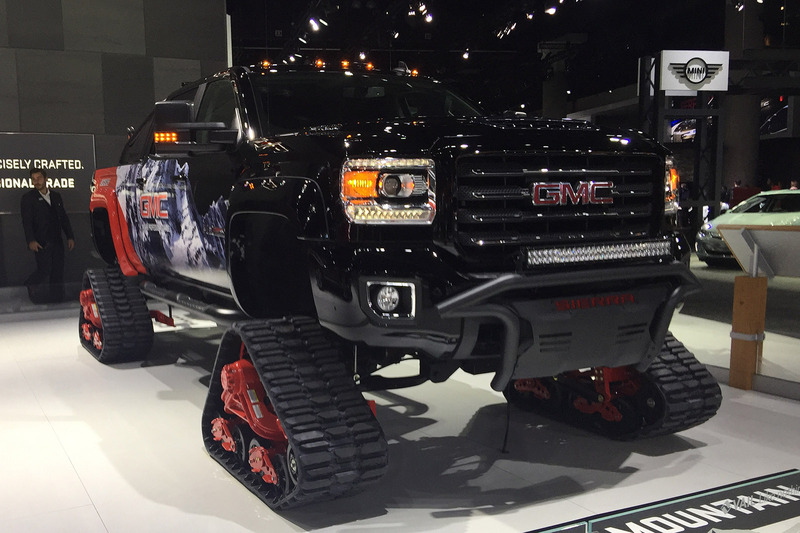 Toyota fashioned theirs with kayaks on the back, while GMC’s All Mountain Concept replaced wheels for tracks, plus obligatory ski gear. The real highlights of the show were three cars: The Mercedes-Benz CLS, BMW i8 Roadster and Chris Bangle’s out-there city car, called Red. The choice to launch the CLS in LA, Mercedes says, was based on two reasons: it fitted the car maker’s product cycle, and, as a “designer’s car”, Mercedes has a history of launching slightly different cars here which aren’t mainstream in the way, say, an E-Class or S-Class is. The long-awaited i8 Roadster seems the most obvious fit of all the reveals. Californians love electric cars and it’s a roadster, which obviously suits the climate (it was 20 degrees here during the show days, though you wouldn’t know it in the LA convention centre). And then there’s Chris Bangle’s angular car, called Reds, for a little known (at least in the UK) Chinese firm CHTC. Talking us around the car, Bangle was incredibly enthused about the premium city vehicle aimed at young Chinese urbanites. He reckons it will make production by 2020 and despite the wacky design, says he doesn’t expect much to change much looks-wise. Read on to check out all out coverage from the show's press day. At the show we had Autocar editor Mark Tisshaw, and news editor Rachel Burgess, while back in our Twickenham base camp we had online editor James Attwood, senior staff writer Sam Sheehan taking care of the news, editorial assistant Sam Jenkins doing all things social media, and Jimi Beckwith compering for the live blog. Scroll down to read all the action from this year’s LA motor show. The Porsche 718 Cayman and Boxster GTS - remember these? They were revealed so long before the show that they don’t feel like LA cars, but they are, and they pack 361bhp. Another Porsche, the 911 T, also went on display, as a pared-back purist’s special. Yes, another one. We're not complaining, mind. Mazda 6 - Although it might not look much different to the old one, the Mazda 6 facelift also showed its newly nipped and tucked face at LA. Wait a few months and we’ll see the European version. Genesis G80 - We got a look at the G80, Korea’s answer to the BMW 5 Series. The country's car makers are coming ever closer to upsetting the status quo in the car industry, by edging ever closer to German rivals. BMW i8 Roadster - One of the biggest cars of the show, the BMW i8 Roadster, raised the roof at the LA Convention Center. See, that's a pun, that is, because the Roadster doesn't have a route. Sorry. Lexus RX L - The world has gained another SUV. This is a seven-seat version of Lexus’ largest SUV, rivalling the Range Rover and upcoming BMW X7. Mercedes-Benz CLS - One of the absolute stars of the show, and with a fresh design that has split opinion a bit. The front, with styling elements that will also feature on the next A-Class, has gone down fairly well, but it’s the rear where opinion is divided. Speaking of dividing opinion, we suspect this piece by editor Mark Tisshaw will - he's unsure if Mercedes even needs the CLS any more. Nissan Star Wars cars - Nissan has gone to town (Mos Eisley, presumably), and then past town to outer space, for its LA efforts. It has developed six concepts to promote its tie-in with the Star Wars franchise. It's worth taking a look just so you can see a Nissan X-Trail with X-Wings on. Really. Editor Mark Tisshaw has been over to the Jeep stand to take a look at the new Wrangler. His view: "Don't be fooled by the familiar appearance: it's all-new. The whole car has been redesigned from the ground-up, one highlight being a 9% aerodynamic improvement." Tish also had a quick chat with Jeep boss Mike Manley, who reckons a busy couple of years lie ahead afor the firm. After the launch of the new Wrangler comes a replacement for the Cherokee later next year, followed by a Jeep pick-up in 2019 and the Grand Wagoneer range-topper in 2020. 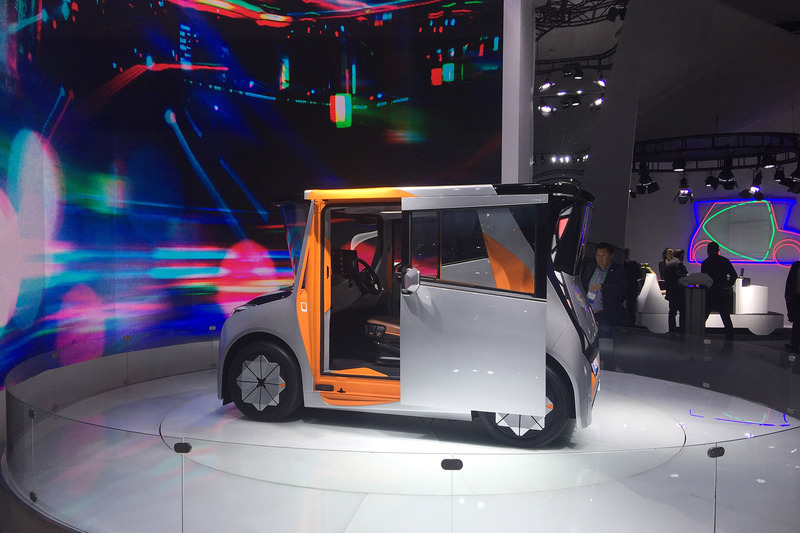 Rachel recounts a surreal experience: "Possibly one of the most surreal scenarios I’ve ever found myself in: famed designer Chris Bangle talking me around his new crazy Chinese city car. The idea is that the interior is a genuinely useable space, and not just for on the move. That means there’s a foot massage function in the passenger footwell of the car. Chris insisted I tried it... one of the most relaxing interviews I’ve ever done, I must say." More BMW snippets from Tisshaw: "There's no official update to the production version of the BMW iNext concept car shown at the recent Frankfurt show and again in LA, other than BMW is "on time" for a 2021 launch, according to BMW i boss Robert Irlinger. He did confirm that the car would be built on a development of the same rear-wheel drive architecture that underpins the rest of BMW's rear-drive range, and in the same Dingolfing factory that makes the 5 Series and 7 Series." BMW's in a solid state of affairs about future battery tech: "Solid state batteries are a technology that BMW's i brand is investing in and developing as one of a number of different battery chemistry investigations in a recent €200 million investment, according to i boss Robert Irlinger." Tish is admiring Jimi's next long-termer. Maybe. "The design is already a few years old but standing and admiring the Ford GT never gets boring. Just look at that colour, those stripes... Want." 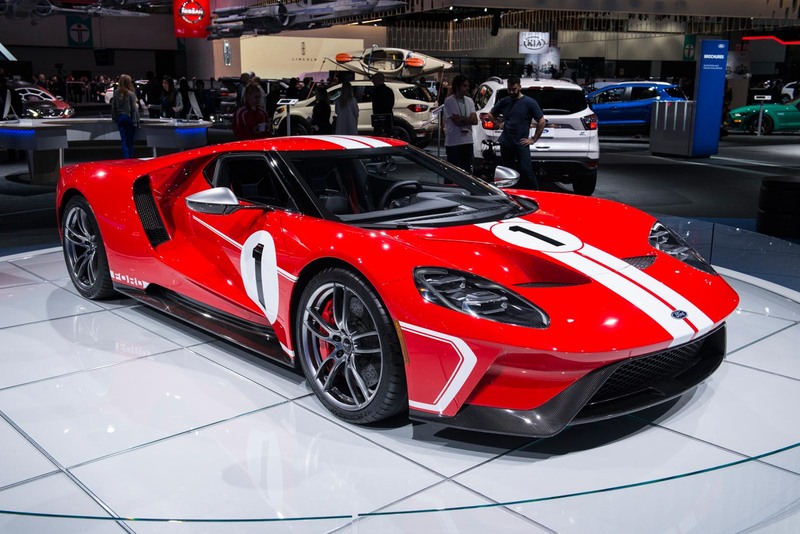 While we're thinking about the Ford GT, why not take a break from reading all these words and check out Matt Prior's excellent video review of it? 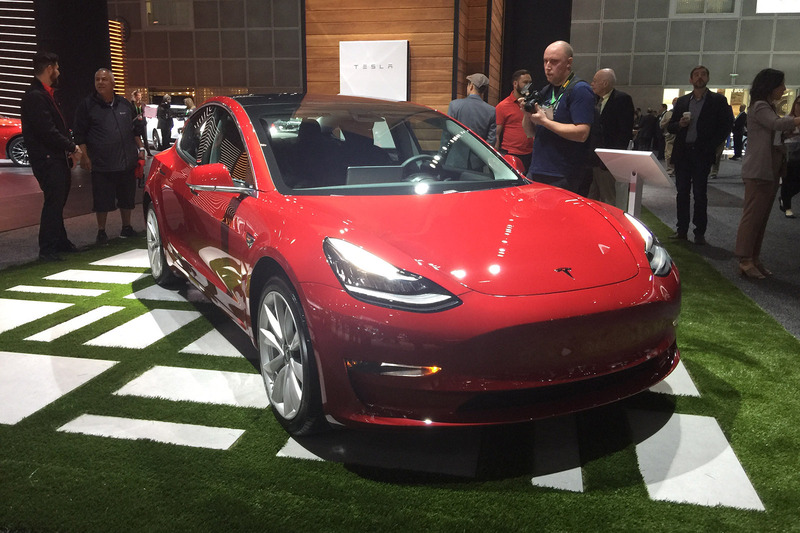 Tesla's on the PR offensive: "Tesla doesn't tend to 'do' motor shows, yet here it is in LA with its Model 3, the model currently involved in 'production hell' according to boss Elon Musk. The cheery stand staff are courting breakfast tv media here, with some success. What crisis? Ahem." Tish has stumbled across the betracked GMC too: "New niche alert: the car without wheels." Ah, the quirks of the American car industry: "I must admit a seven-seat Lexus isn’t awfully interesting to me - but in the US, this is likely to be an important player for premium SUVs. The amount of people filming it or getting in and out of it also telling, compared to plenty of other cars here," says Rachel. Meanwhile, Tish has been talking electric BMWs with i boss Robert Irlinger. He says the i8 Roadster will outhandle the old coupe model following the chassis changes made, most significantly to the rear suspension and axle. Fear not though i8 coupe buyers, for the changes (that also include a bigger motor and battery pack) are also being rolled out to the coupe model at the same time. ...don't get too excited though. "It's the new Kona," reports Rachel. "Old(ish) news for Europe." It is indeed: you can actually read our review of the SUV here. We quite like it. Meanwhile, Mark Tisshaw spotted, well, something. He said: "Have always lusted over the Carrera GT, until I saw this..."
Rachel has been admiring a good old-fashioned American truck: the GMC Sierra 2500HD All Mountain concept. It runs on Mattracks 150 Series Tracks, which ensures it can get the 445hp from its 6.6-litre turbodiesel engine down in pretty much any conditions. It's not all rugged though: apparently it has premium interior features, including leather trim and Bose speakers. "Even by American standards, this is out there," remarked Rachel. "Certainly the transport I’m intending to use for all future ski trips." Volvo boss Hakan Samuelsson has been telling a bunch of American journalists about the new Care by Volvo subscription package, which brings the number of countries in which its offered up to eight, including the U.K. Samuelsson said the scheme was a reflection of changing customer demand, citing the mobile phone as the catalyst for changing attitudes. Rachel has just walked past the Jaguar stand, where there was a display of I-Pace models, including the racing version that will be used for a one-make Formula E support series from late 2018. She said: "Jaguar is trying to keep momentum up for its electric I-Pace ahead of going on sale next year. Big question: who will get there first - Jaguar or Audi with its E-Tron?" In the build-up to the show, Jaguar named the first team to have signed up for the I-Pace eTrophy race series: US squad Rahal Letterman Lanigan Racing. The team is run and part-owned by Bobby Rahal, a three-time Indy car champion and former Indianapolis 500 winner, and former US chat show host David Letterman. The team currently runs cars in the US IndyCar Series and endurance racing. Nervous, Tish? "Excuse the blur but the dog unexpectedly barked and it made me jump. LA breakfast TV at its finest: apparently we can find out why he had the dogs with him after the break. Forgive me for not hanging round to find out why." Things are quite different for Subaru in the US, says Mark: "The Subaru Ascent is a long way from being the most exciting new car at the LA show, yet it's the latest evidence of the flexibility of Subaru's new architecture, and should find success in a market where Subaru is so successful." Aren't some people hard to please? Sam Sheehan is underwhelmed by the i8's interior: "I love the i8. It’s a brilliant piece of design and the hybrid powertrain still impresses to this day. But I can’t help but notice how dated the interior looks now (never thought I’d say that when it was launched) – especially when it’s on full view via the i8 Roadster." The covers have come off the Mazda 6. It's a subtle tweak, granted, but the chassis modifications are what will make the most difference. Here's the reveal story. The new Aston Martin Vantage has made its motor show debut in LA, in a lurid shade of flourescent yellow. We've already taken a ride in one, albeit in prototype form. You can read that here. Bangle's had it hard from the press in the past, but unnecessarily, says Tish: "God bless the creativity of Chris Bangle. His comeback car, the Redspace, is wonderfully weird and as creative as you'd expect. Cars shouldn't all look the same, and Bangle's ability to challenge the status quo should be celebrated and not sneered at." 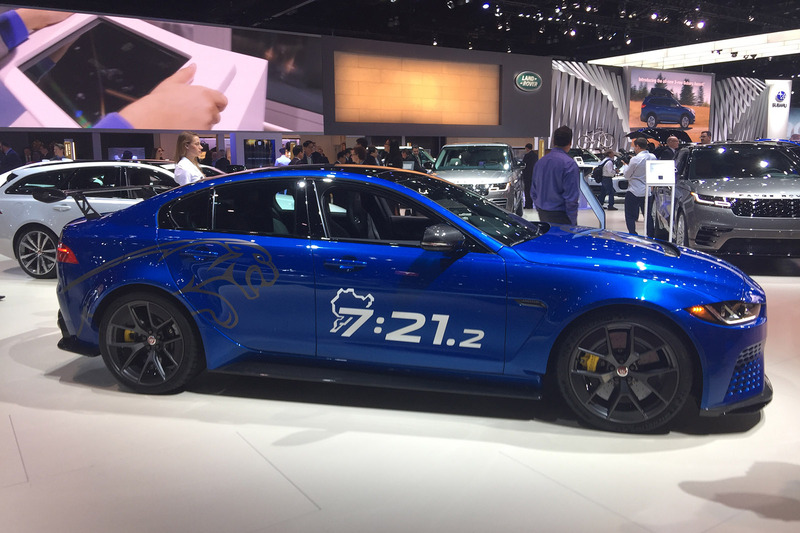 "No new metal from Jaguar in LA," says Mark, "but pay attention to the sticker on the side of Project 8. It's the Nurburgring lap record time of the car, and enough that should sell the last 100 or so remaining cars by the end of the week." There goes another - Lexus' seven-seat RX, the RX L, has been revealed, and is almost identical to the five-seat version. Need a clue? Look at the angle where the boot lid meets the roof. Tish is scoping out the competition to Mercedes - could Genesis pull off a four-door coupé like the CLS? 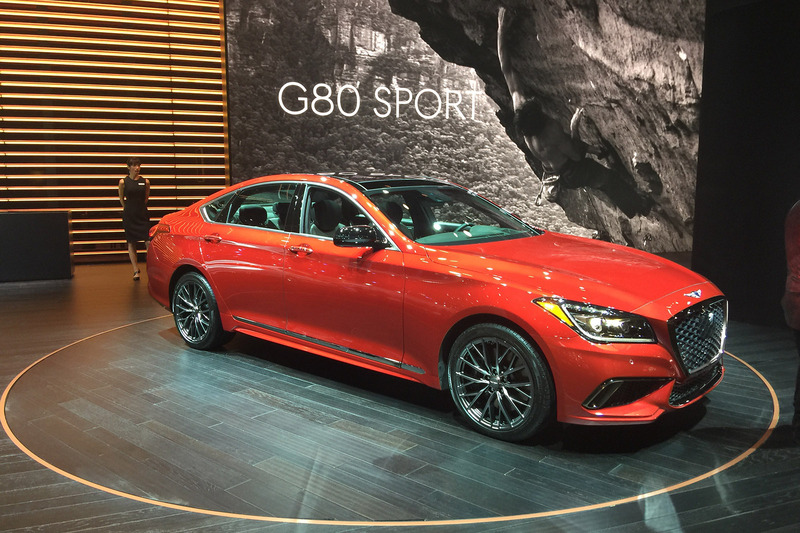 "Smart looking Genesis G80 Sport is the Korean 5 Series. Genesis styling is headed up by ex-Lambo and Bentley design boss Luc Donckerwolke, who has created a look to shame the creativity at Audi. The cars are good to drive too." There's another one - the new Mercedes-Benz CLS has been revealed. It's got the new face of Mercedes on it, although at Autocar HQ it's dividing opinion with the rear styling. What do you think? One of the biggest car makers in the world has one of the biggest stands, says Rachel: "Prize for biggest stand so far? Toyota. 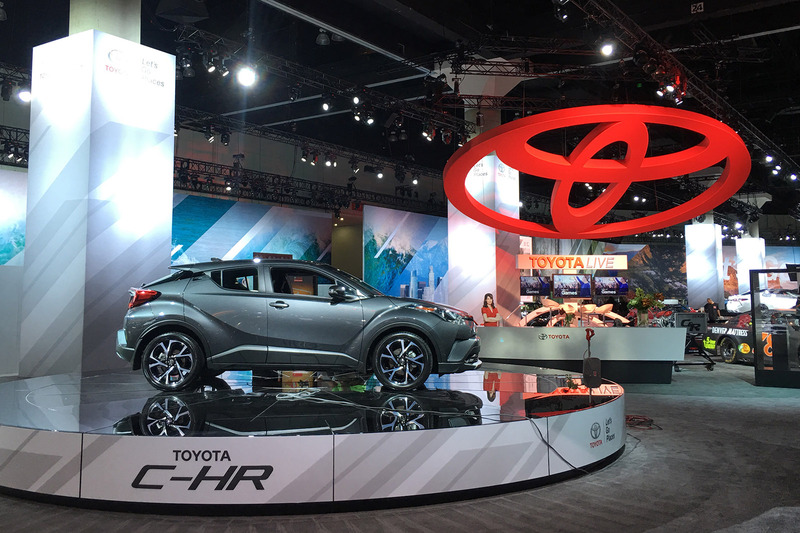 Awash with pick-ups (of course) and the C-HR." First up, BMW has revealed the i8 Roadster at the show. It's got 369bhp, two seats and a roof which retracts in 15 seconds. Read more about it here. Next, Nissan has revealed no fewer than six (SIX!) concepts devoted to the brand's partnership with the Star Wars franchise. They've gone to quite some lenths for these. Last, and not technically LA news but something you should be excited about anyway, is that Lamborghini has revealed the official reveal process for its first SUV, the Urus. No more camouflage, no more fleeting, blurry shots; the actual car. Well, a tiny fragment of it. Rachel's taking in the first impressions of the show: "Given where we’re at, it only seems fitting the first car maker on sight as I walk into the hall is... Tesla." Mark sure knows how to convey all the information you need without any fuss: "Now in." Rachel's in! 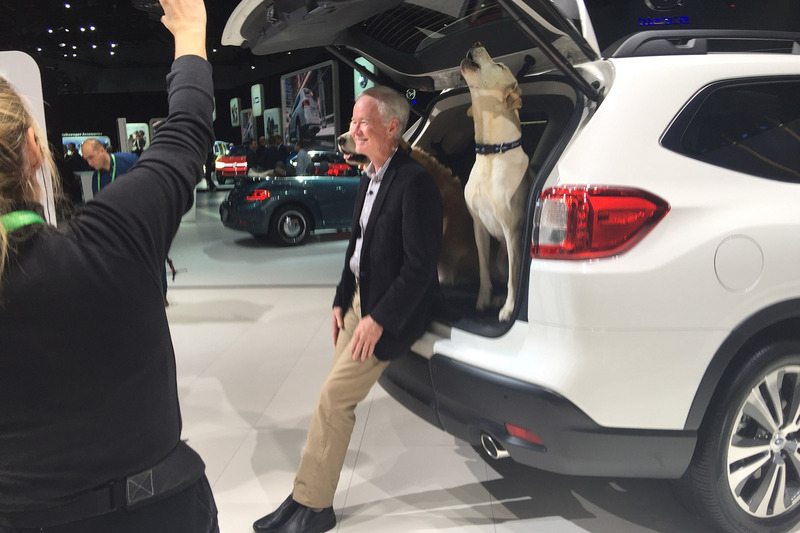 And some familiar faces were there to greet her: "The calm before the storm here at LA motor show. The world’s media is waiting patiently to be allowed into the halls where we’ll find lots of shiny new metal. 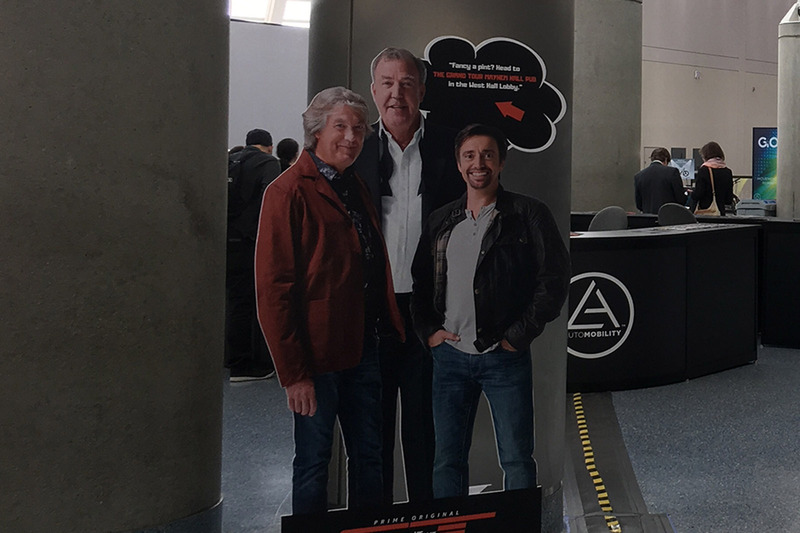 Amid the people, Ive spotted a life size advert of those three incorrigible ex-Top Gear presenters plugging the new series of Grand Tour." Remember, LA time is eight hours behind the UK, so while the UK leaves the office for home, Rachel and Tish are readying themselves for a long day of action at the Los Angeles convention centre. Infiniti revealed its QX50 late last night; a rival to the BMW X3 and Audi Q5 with a variable compression ratio engine. It’s pegged, again, as a car which could boost Infiniti’s rather loose hold on the European market when it arrives. Yes, another SUV, but this one’s not for us - Subaru revealed its Ascent large SUV, in production form, ahead of the show. And yes, it’s got a boxer engine, with 256bhp. Bangle’s back, and his design is as divisive as ever. He’s been working on REDS - an electric city car for China, and he’s been working with Chinese electric truck company CHTC to bring it to fruition. Rachel’s been chatting with Mercedes and AMG executives, who have confirmed the power outputs of the new CLS 53 hybrid, and the next AMG A45; 429bhp and more than 400bhp respectively. Goodness. Read more about the CLS 53 here, and get the latest on the A45 here. Bored of the Chevrolet Corvette ZR1 already? Chevy’s got it covered, or in this case, uncovered, with the unveiling of the ZR1 convertible ahead of the show. Toyota will be showing a large, rugged SUV concept. Yes, another, but SUVs are the new whatever-the-last-trend-was, and this one looks like it’ll actually venture off road. If it ever makes it to production. It’s called the Future Toyota Adventure Concept, or FT-AC. Good initials, Toyota. California-based engineering company Aria is revealing a high-performance concept model in LA, as shown by a single preview image. The picture reveals little other than that the car will have a fixed rear wing and intakes over the rear, suggesting it will be mid-engined. The drop-top version of BMW’s hybrid supercar has been spotted testing and hinted at a few times now, so a reveal in sunny, eco-friendly Los Angeles fits the model perfectly. It’ll spearhead the facelifted i8 range, following the facelift of its smaller i3 sibling. Genesis pulled the wraps off of its rear-wheel-drive G70 saloon in September, but the car makes its public debut at the LA motor show. Despite its imminent arrival in the US, the Mercedes-Benz C-Class rival isn't due to make it to Britain until 2021. Yes, it's another SUV, but they are the voiture du jour. Infiniti’s QX50 - a rival to the Audi Q5, BMW X3, Mercedes-Benz GLC - is a close follow-up to the QX50 concept that was revealed at the Detroit motor show less than a year ago. Despite being leaked earlier this year, we get our first proper look at the most rugged Jeep in the brand’s stable at LA. Expect ferocious go-anywhere ability, throwback looks and a smaller entry-level engine – a 2.0-litre rather than the current car’s 2.8-litre. Mild refreshes to the Range Rover and Range Rover Sport have brought a more Velar-inspired front end to each, as well as a hybrid powertrain. They’re two more cars that have been given the big pre-show reveal long ago, but the first in-depth, in-the-metal look we get is at the show. Lexus' largest SUV, the RX, is about to get even bigger, with the introduction of a three-row version at LA. It'll be available in 350L and 450hL versions, meaning there will be a choice between petrol-only and hybrid powertrains. Rivals include the Range Rover and Mercedes-Benz GLS, as well as the upcoming BMW X7. Mazda's handsome saloon is reaching the mid-point of its life cycle, so it's getting a nip and tuck to keep it competitive with rivals such as the Ford Mondeo and Volkswagen Passat. Mazda has already shown most of the car's front-end styling in a preview image, so it's clear where the tweaks are. There's also a new 2.5-litre petrol engine added to the 6's line-up. We’ve already had a ride in the next-generation CLS, but we’ve yet to see what it looks like in full. It’ll be one of two new four-door coupés in the Mercedes line-up, with a four-door AMG GT model to be revealed later. Expect the CLS to keep things more on the tame side in comparison. Porsche has given the 718 range a spruce-up with a new performance flagship model. There’s 361bhp on tap - that’s up by 15bhp - thanks to a new intake system and turbocharger tweaks, as well as styling changes to mark it out from the standard 718 Boxster and Cayman. GTS badging seals the deal. Subaru has revealeed a production-ready three-row SUV called the Ascent at the LA show, fitted a new direct injection boxer engine. Although primarily focused on the US market, the large model's powerplant will likely make it to Britain in future applications. Toyota has released a teaser image of a concept machine it will launch at the show. The Future Toyota Adventure Concept is understood to be an off-road SUV-style machine. The firm showcased an urban SUV concept, the FT-4X, at this year's New York show. A snooze-fest, in other words. Is pretty much it for me. Just don't why though.